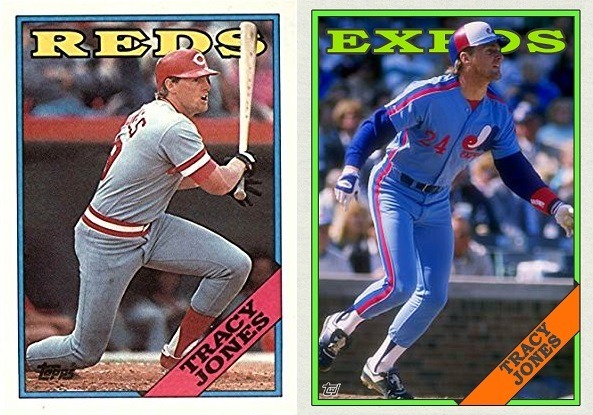 Tracy Jones was supposed to form one of the greatest outfields in the history of baseball with Kal Daniels and Eric Davis and usher in the era of the New Red Machine. That didn’t happen. 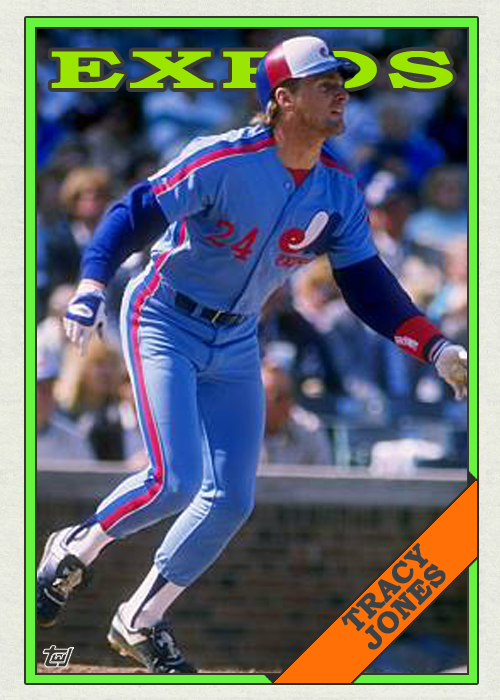 Instead, Jones was sent to Montreal in 1988, then was traded to the Giants, then the Tigers, then the Mariners, and was out of the major leagues after the 1991 season. Jones found new life on radio in the 21st century, but was let go from Cincinnati’s 700 WLW in 2017 after ten years as on-air host. 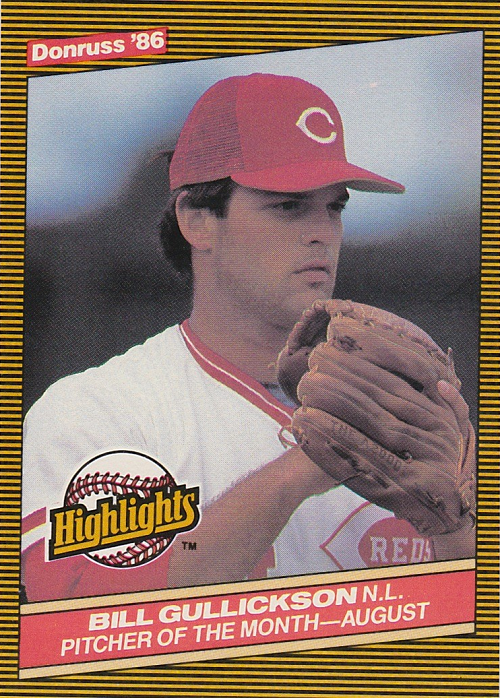 His son, Hunter, is currently in the Nationals’ minor league system. Comparing these cards side-by-side, I see that I messed up on the nameplate by not stretching the player name. I’m not overly concerned with it, though. 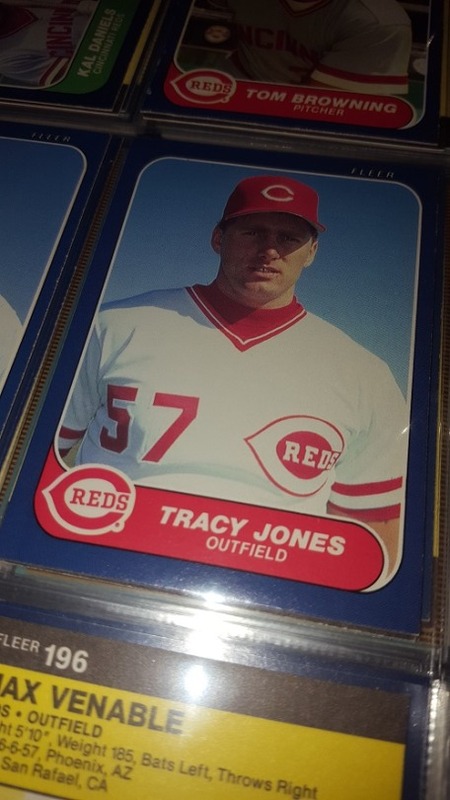 Happy Reds birthday, Tracy Jones! 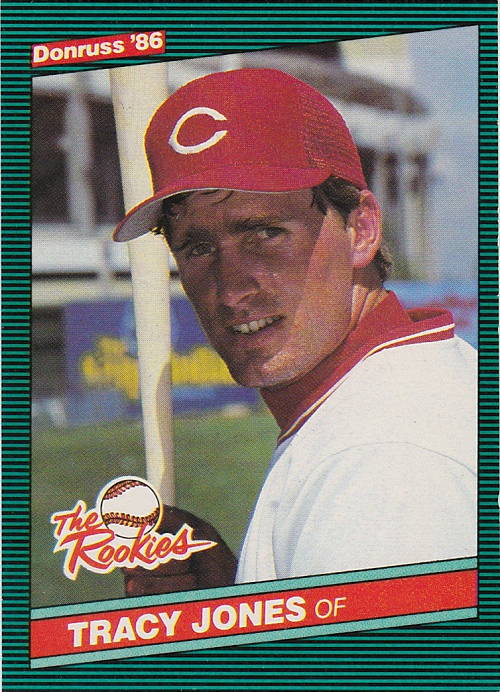 Tracy Jones debuted with the Reds on Opening Day, 1986, and collected his first big league hit off one of the greatest left-handed pitchers of all-time, Steve Carlton. He also took a walk off Carlton, stole a base, and scored a run. Not a terrible debut. He is currently co-hosting an afternoon radio show with Eddie Fingers on Cincinnati’s 700 WLW. I always like Tracy Jones. He was hard-nosed and left it all out on the field. Currently he hosts a mid-day radio talk show on 700 WLW with another local icon Eddie Fingers. It’s not always sports, but it’s always entertaining. Well, almost always. There is also an on-line Tracy Jones Fan Club. 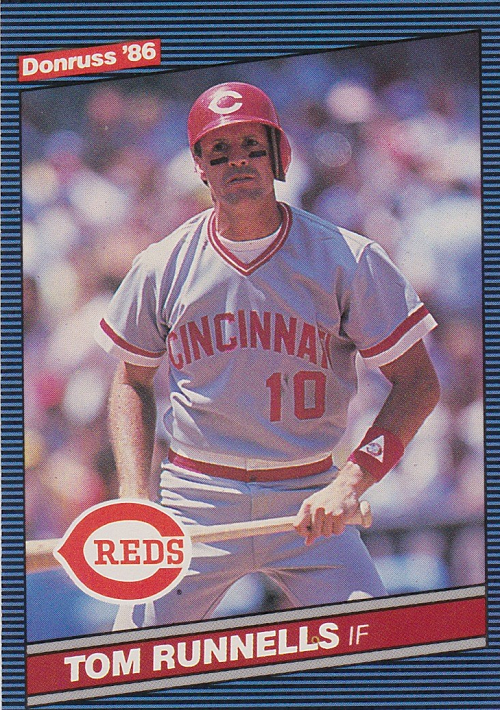 Tracy Jones, the hard-nosed hustler who came up with the Reds in the 1980s and played for a number of teams during his career, before becoming a radio host on 700 WLW here in Cincinnati. He’s on the air every weekday from 3-6 pm with Eddie Fingers. He’s fun to listen to, he’s conservative on most issues, and he gives insights into the sport on a non-sports show. Chris “Spuds” Sabo, one of my absolute favorite players, one of the players I collect, autographed!!! A spectacular gift, and much appreciated from 30-Year Old Cardboard! This was a good week for the mailbox. A few days ago I received a pack of soccer cards from the Bad Wax Forums for being one of the first 10 people to post five times on the board. I actually didn’t even know about the contest until after I started posting. It’s a great place to talk about baseball (and other sports) cards, sets you are working on, trades, great pulls, etc. There is also a forum for the Fun Cards set which is in progress. If you are a collector, come on over and start discussing your collection with others. 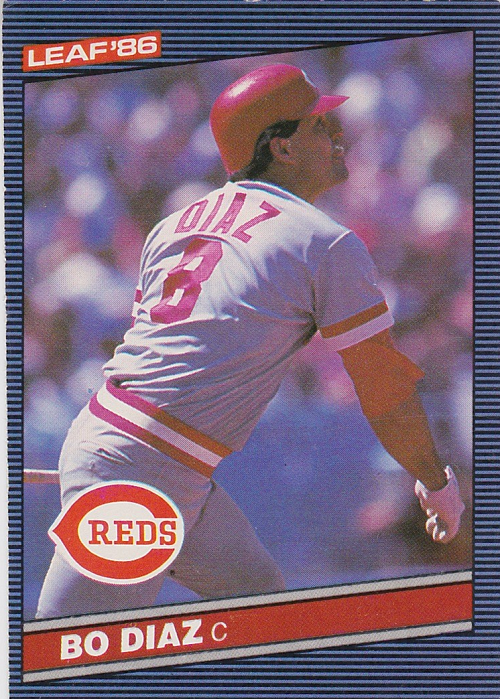 Today, I opened my mail to find some O-Pee-Chee and other cards from the 88 Topps blog. Andrew is giving away cards left and right, and he even threw in a couple bonus cards in my prize. I got the Delino DeShields draft card (which was not in the regular Topps set), John Franco, Dave Parker (Cobra for the HOF! ), Tracy Jones (who now has a talk show on 700 WLW in Cincinnati), Shawon Dunston (one of my all-time favorites), and Tom Henke. He also threw in a couple of Topps’ “Fan Favorites” cards, Fergie Jenkins and Ken Griffey Sr. A great surprise, and much appreciated.